You can view statistics for any segment in the “Finished” status. To view statistics, click in the segment row. Statistics show the segment coverage and the distribution of users in it by gender, age, location and types of devices used. 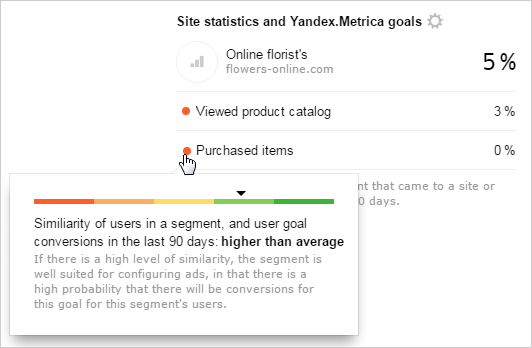 Also, you can see similarities between users in the segment, their common categories and interests, statistics for sites and Yandex.Metrica goals. Similarity shows how similar users in the same segment are to each other in terms of internet behavior. Similarity is based on the visited sites, search query categories, and social and demographic profile (gender, age, city of residence and other characteristics). The higher the similarity, the more uniform behavior the segment users have. This type of segment works well for the similar users search. Low similarity means that the segment includes heterogeneous users (young and old, with low and high income, from different cities, and so on). It is hard to find common features in a segment like this, so the users found will also be different. 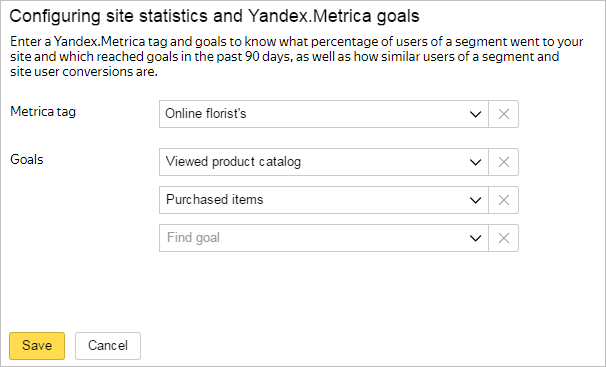 Use site statistics to learn the percentage of users in the segment who visited the site or reached the Yandex.Metrika goals. You can configure statistics in the Main tab any time after the segment is created. Specify the counter and up to three Yandex.Metrika goals. You can use your own tags and Yandex.Metrica goals or tags and goals to which you have guest editing access or representative's access. Statistics collection takes several hours. When statistics collection is finished, you can view the percentage of users in the segment who visited the specified site. If you set goals when configuring statistics, you can also see the share of users in the segment who reached each of these goals. Point the cursor at the circle next to the goal name to view the similarity of users in the segment and the similarity of the internet users who reached this goal. Statistics are available for the past 90 days. Statistics show that some users in the segment visited your site and viewed the catalog but didn't buy anything. Also, they are similar to those who bought products on the site. There is a high probability that users in this segment will be interested in buying something. You can show ads about special offers and discounts to these people. To change the source site or goals, click . The 100% index value indicates that the users are interested in “Cooking” to the same extent as internet users on average. The 200% index value for car owners indicates that the users in the segment are interested in this topic twice as much as average internet users. The 140% and 50% index values for the categories indicate that there are 1.4 times more car owners and housewives in the segment than on the internet on average.